Ryder® Fleet Products offers a wide variety of professional lifting equipment and carry both imported models and made in the USA models. With the July 4th holidays just around the corner, we decided to feature our made in the USA Jacks this month. The country of origin is an important consideration for many, and especially for military and government organizations. Some companies specify that a certain percentage of their purchases be made in the USA and want to know which products meet the requirements of the Buy American Act and Federal Acquisition Regulation (FAR). Other individuals, maintenance shops and fleets simply like to buy products made in America when they can. We hope this guide will help with your choices of lifting equipment. What is the Buy American Act and Federal Acquisition Regulation (FAR)? Depending on the manufacturer, all of the jacks we have highlighted below either comply with the Buy American Act and FAR or is manufactured or assembled in the USA or North America, or assembled in the US with US and Global components. Where Can I Find Jack Stands Made in USA? Ryder® Fleet Products offers USA-made Jack Stands from Norco Industries and Hein-Warner – from 3 ton stands suitable for working on automobiles and small trailers to a pair of 25 ton stands capable of supporting a fully-loaded trailer. 25 ton Low Profile Jack Stands Great for fleet and maintenance garages where low profile stands are needed to support trucks and loaded trailers. 10 ton Medium Profile Jack Stands The medium profile design allows more clearance than the low profile stands when supporting trucks, trailers, and agricultural equipment. 10 ton Heavy Duty Tall Jack Stands For fleet garages, trucks, trailers, agricultural and construction maintenance shops where a pin type height adjustment column is desired. 20 ton Trailer Stabilizer Jack Stand Stabilizes and assists in supporting the front or rear of a loaded or unloaded tractor-less trailer. 3 ton Jack Stands For automobiles, small trailers and small tractors. Hein-Werner dominates this category with their selection of 2 ton, 3 ton and 10 ton floor jacks. Their 2 ton jack, the “True Blue”, has been a long-time favorite of military, government and private sectors. 3 ton Floor Jack For lifting mid to full sized cars, vans and SUVs. Heavy duty frame suitable for the professional technician. 10 ton Air/Manual Floor Jack Lifts trucks, trailers, and buses by the axle, differential, or frame. Whether you work with light truck or heavy duty transmissions, these USA-made transmission jacks help make the job of removing and installing transmissions safer and more secure. 1.5 ton Heavy Duty Transmission Jack For use with heavy truck transmissions. Great for truck dealers, maintenance and heavy duty transmission repair shops. ½ ton Telescoping Air/Hydraulic Transmission Jack Combines air and hydraulic power for maximum speed and accuracy. Ideal for professional technicians looking to increase shop productivity. 1500 lb Engine Load Leveler Attaches to a crane to position automobile and light truck engines and other vehicle components. 3 ton Electro/Hydraulic Floor Crane For lifting heavy items including removal and installation of diesel engines and transmissions. 6000 lb Auto Dolly Use to easily move cars, trucks, ATV’s, boats, trailers and lawn equipment. 8.5 Ton Long Reach Air Lift For truck, bus, farm equipment and motor home applications where a long reach jack is required to lift at the vehicle bumper, frame or front axle. Wheel Dollys (pair) For the safe moving of wheels around the workshop floor. Norco Industries has been engineering and manufacturing safe, reliable, high-quality products for the professional repair marketplace since 1964. In align with their tagline “When Safety Depends on Performance”, you won’t find a cheap, throw-away jack with the Norco name. You’ll find a product you are confident with that exceeds your expectations. In fact, Norco is the number one brand requested and used by our Ryder® maintenance shops for professional lifting and hydraulic products. Originally a part of the Marquette and Lincoln Automotive line, Hein-Werner became a division of SFA in 2003, after struggling several years to find a new home. SFA, a leading distributor of hydraulic lift equipment in the US and Canada, has worked to bring the Hein-Werner brand back to its former glory. The brand is once again manufactured or assembled in the USA and still delivers the same dependability and rugged design that earned it the status of a classic, tried-and-true American brand. This entry was posted in Product Reviews and tagged floor jacks, jack stands, transmission jacks, usa made jack stands by Ryder Fleet Products. Bookmark the permalink. This is ALAN Pullen and I was chatting with Jon about your floor jack.Your part #is TOL OMEHW93642 AND THE. ID #OMEHW 93642. Hi Alan. Thanks for your comment! Yes, you are correct. The part number for the “2 Ton TRUE BLUE Floor Jack, Made in USA” is TOL OMEHW93642. 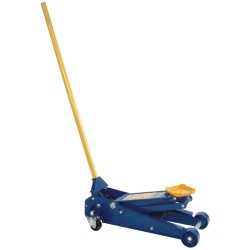 You can order it directly from our website at https://www.ryderfleetproducts.com/omega-omehw93642/2-ton-true-blue-floor-jack-made-in-usa-p-tol-omehw93642. And, you’ll receive FREE SHIPPING! (all orders over $250 ship standard ground for free). Thank you for your interest in our MADE in the USA Floor Jacks! I really like to be able to find a great USA FLOOR jack. I saw your website.